Seemingly every year, there is speculation that a prominent impending free agent could be the one to finally bring the “sign and trade” back to the NHL. The sign and trade is relatively self explanatory; a player re-signs with his current team to a contract negotiated with a second team that he is subsequently traded to. In the current structure of the NHL, the sign and trade could hypothetically be used to add an eighth year to a contact, as free agents are limited to a cap of seven years when negotiating with a team other than their current club. This season, TSN’s Pierre LeBrun has reopened the sign and trade discussions, this time in regards to Ottawa Senators forward Matt Duchene. LeBrun speculates that Duchene has approximately two weeks to work out an extension with the Senators before the team will be forced to shop him. Ottawa has reportedly already made an initial offer of eight years and $64MM, but Duchene is likely to be eyeing an AAV closer to $9MM per year instead of $8MM. If that counter is too rich for Senators owner Eugene Melnyk and company, the team could not afford to miss out on a the potential return for Duchene at the trade deadline. When it comes to a sign-and-trade, things get tricky for the player, which could explain why it remains such an infrequently used device in the NHL. While the eighth year is enticing for Duchene, especially at his desired salary, signing that long-term deal means a) getting another team to first agree to that contract and b) trusting the future plans for that franchise. The last time Duchene was traded, from the Colorado Avalanche to the Senators early last season, it didn’t work out so well. Duchene may be hesitant to sign with a team for eight years simply because they can afford to acquire him this season. A sign and trade also eliminates Duchene’s opportunity to test the free agent market and potentially maximize his market value. Duchene will undoubtedly be the top center on the UFA market this summer and may wish to weigh his options rather as a first-time free agent rather than commit to another team so soon before seeing what else is out there. A sign and trade works out nicely for the Senators, as they would surely receive a better return, but finding a trade partner could be difficult and getting Duchene to go along with the plan may not happen. For these reasons, a sign and trade remains an unlikely result to the ongoing Duchene saga. The Tampa Bay Lightning have all the makings of a true trade deadline buyer this season: they are the first-place team in the league by a considerable margin, will have upwards of $8MM in cap space by the deadline, and are facing an impending cap crunch that could begin to dismantle their roster as early as this off-season. The Lightning are in win-now mode and, with excellent odds of winning the Stanley Cup, will look to add the best reinforcements they can ahead of the deadline. However, the Lightning may struggle to make the trades typically seen by a true buyer. Tampa Bay currently has 49 players signed to professional contracts against a cap of 50, per CapFriendly. The team probably doesn’t want to hit that 50-contract mark either, as it would take them out of the college and junior free agent market this spring. This means that the Bolts cannot simply trade picks and prospects for rental players. Instead, GM Julien BriseBois will have to get creative with sending under-contract players the other way. Only two of Tampa’s 49 “pro” players are in juniors, meaning that any trades will likely send current AHL contributors to sellers and the team will effort to do so without hurting their postseason depth. At the end of the day, Tampa Bay’s trades at the deadline may end up looking more like hockey trades – player-for-player talent swaps – than you would typically see from a deadline buyer. Sportsnet’s Andrew Berkshire believes that there is great long-term value to be found in the current buyer’s market. Berkshire writes that the Los Angeles Kings’ Tyler Toffoli, the Chicago Blackhawks’ Brandon Saad, and the Florida Panthers’ Evgeni Dadonov are among the best bargains potentially available on the market due to their recent struggles and/or under-the-radar trade status. Berkshire states that Toffoli’s value is at a career-low given his current 33-point pace for the down-and-out Kings. However, Toffoli notched 47 points just last year and has 20+ goals in three of the past four seasons. The two-way forward also has a palatable $4.6MM cap hit and could be a buy-low candidate that blows up with a change of scenery. Similarly, Berkshire believes that Saad’s value is still low after bottoming out last season. He has rebounded this season, but is still on pace to fall short of the 50+ points that used to come consistently for him. At $6MM AAV for two more years, Saad’s contract isn’t egregious but is a strain for the cap-strapped Blackhawks. They could be enticed to sell low on the power forward and could very well end up on the wrong side of a Saad trade for the third time. Conversely, Berkshire believes that the Panthers are happy with Dadonov and would be reluctant to move him, but may feel pressured to sell at the deadline despite few obvious rental pieces. The play-making winger is quietly on his way to another 65-point season or better and with one year left on his contract at just $4MM, is already a bargain and could be even better elsewhere. Florida won’t give him up easily, but considering the upside that Dadonov has shown, he could still prove to be a steal even with ample trade capital going the other way. Bogdan is a solid, shutdown defenseman who adds depth to our blue line and possesses a strong work ethic. He’s proven himself to be a reliable defensive presence on the international stage and in the KHL and has the ability to be a steadying influence on the back end for our young defensemen. 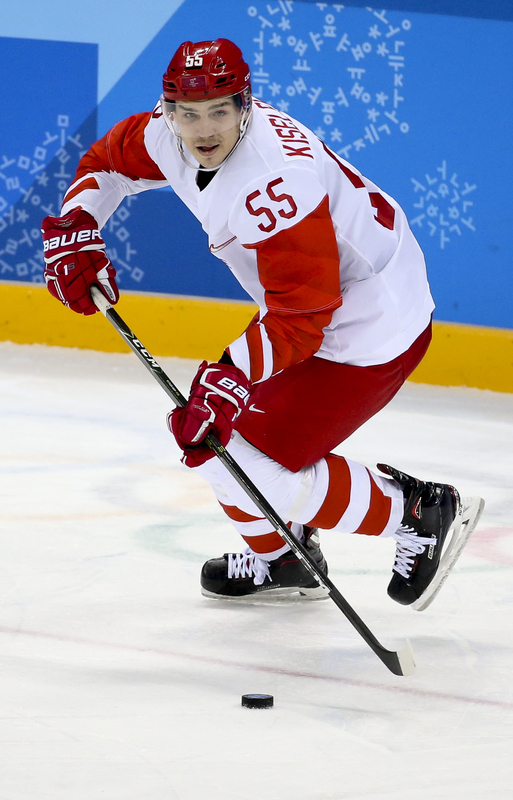 Kiselevich, 28, has been on the radar of NHL teams for some time, making his KHL debut nearly a decade ago. The defensive defenseman is a well-known shutdown option in Russia, and was recently used in that role at the Olympics. The Russians obviously won gold, though couldn’t repeat the feat at the recent IIHF World Championship. If this experiment is as successful as Dadonov’s, the Panthers will be adding another impact player for a run next season. The Florida blue line already looked pretty crowded, but Kiselevich has experience playing both sides and should be versatile enough to play with nearly any type of partner. Though not known for his offense, he has had solid production in recent years playing a simple game and joining the rush when the opportunity presents itself. Kiselevich will be an unrestricted free agent again next summer, but after waiting so long to come to North America one has to believe that the Panthers have the inside track on any future deals. Something convinced him to come to the NHL finally, and if he finds success in Florida it wouldn’t surprise to see them re-sign him at some point. Remember, any extension can’t be signed until the new year since he’s on a one-year contract. As Panthers’ reporter Harvey Fialkov opines, this could mean trouble for Alex Petrovic, who plays a similar game and is a restricted free agent this summer. Petrovic saw his ice time reduced dramatically this season, and could be a potential trade chip for the Panthers this summer. Either way, this signing only strengthens a Panthers team that looked ready to compete for the playoffs in the second half of last season. Montreal forward Phillip Danault was released from the hospital this morning and is resting at home after he was hit in the head by a 124 kilometers-an-hour slapshot by Boston Bruins defenseman Zdeno Chara, tweets Arpon Basu of The Athletic. The 24-year-old was just 10 feet away with 1:37 remaining in the second period when he tried to block the blistering shot only to have it hit him in the head. Danault was motionless for some time, then slowly tried to get up to the applause of the Montreal fans, only to have him collapse again. With blood all over the collar of his jersey, he was wheeled off in a stretcher and taken to the hospital. While indications after the game was that he was OK, that was confirmed this morning by the team. No word yet on whether he will miss time. In the Headlines segment of Hockey Night in Canada, Sportsnet’s Nick Kypreos says the Montreal Canadiens still have high aspirations to trade for Columbus Blue Jackets center Pierre-Luc Dubois. The Canadiens who have a desperate need for center help on their team have long coveted the former third overall pick from the 2016 draft. While there is talk that Columbus does like Canadiens forward Alex Galchenyuk, Kypreos says Columbus currently has no interest in moving their young center, at least until they find themselves fully healthy. Alexander Wennberg only came back a couple of games ago and the team still has other missing players as well. In the same segment, Kypreos also added that with Tampa Bay’s Victor Hedman out for the all-star game, the NHL is considering two replacements for him, including Toronto’s Morgan Rielly and Boston’s Charlie McAvoy. The Florida Panthers intend to put a lot of stock into the next 16 games (number of games before the trade deadline) before they determine whether to bolster their roster, according to Sun Sentinel’s Craig Davis. The team, currently six points out of a playoff spot, has enjoyed great success with their top line of Aleksander Barkov, Jonathan Huberdeau and Evgeni Dadonov, but hasn’t seen the same production from their second line despite a solid season from center Vincent Trocheck. The scribe writes the team wouldn’t be against acquiring a winger like it did a year ago when it traded for Thomas Vanek, but general manager Dale Tallon said any deal would have to factor into their long-term plans. One other factor is that Florida has been playing well of late, having gone 6-3-1 over the past 10 games. Ducks centers Ryan Getzlaf and Ryan Kesler have both returned to practice, notes Eric Stephens of the Orange County Register. Of the two, it’s Getzlaf (fractured cheekbone) that will be the quickest to return as he is hoping to play sometime next week, potentially as early as Monday. As for Kesler, who has yet to suit up this season after undergoing hip surgery in June, his return date is still in question but there is a possibility he will accompany Anaheim on their six-game road trip next week, though that may just be to continue to skate with the team. Predators winger Scott Hartnell has returned to practice and could be ready to return to the lineup on their upcoming three-game road trip, reports Adam Vingan of The Tennessean. He has been out since November 11th due to a lower-body issue. The veteran had gotten off to a good start with Nashville prior to the injury, collecting seven points in 16 games. Rangers center Mika Zibanejad will not be able to return tonight against the Devils, notes Brett Cyrgalis of the New York Post. He is dealing with concussion-like symptoms sustained from a hit on November 24th although they were late to appear as he actually suited up in their next game before missing four straight. There’s no timeframe for when he might get the green light to return. It appears that Florida could get winger Evgenii Dadonov back sooner than expected. He has resumed on-ice workouts and head coach Bob Boughner told Jameson Olive of the Panthers’ team site (Twitter link) that Dadonov will be back sooner than later. The 28-year-old is dealing with a shoulder injury, one that was originally expected to keep him out four-to-six weeks. He’s just two weeks into that so it appears that he is ahead of schedule in his recovery. Jets goaltender Steve Mason has passed through concussion protocol, reports Ken Wiebe of the Winnipeg Sun (Twitter link). Head coach Paul Maurice said that the earliest he will be activated off injured reserve will be on Monday and that depends on how Mason’s workout goes later today. As the holiday season approaches, PHR will look at what teams are thankful for as the season nears the quarter point of completion. There also might be a few things your team would like down the road. We take a look at what’s gone well in the first month and what could improve as the season rolls on. So far we’ve covered ANA, ARZ, BUF, CGY, CAR, CBJ, COL, DET, LAK, NSH, NJD, NYI, STL, TOR, VAN, VGK and WSH. 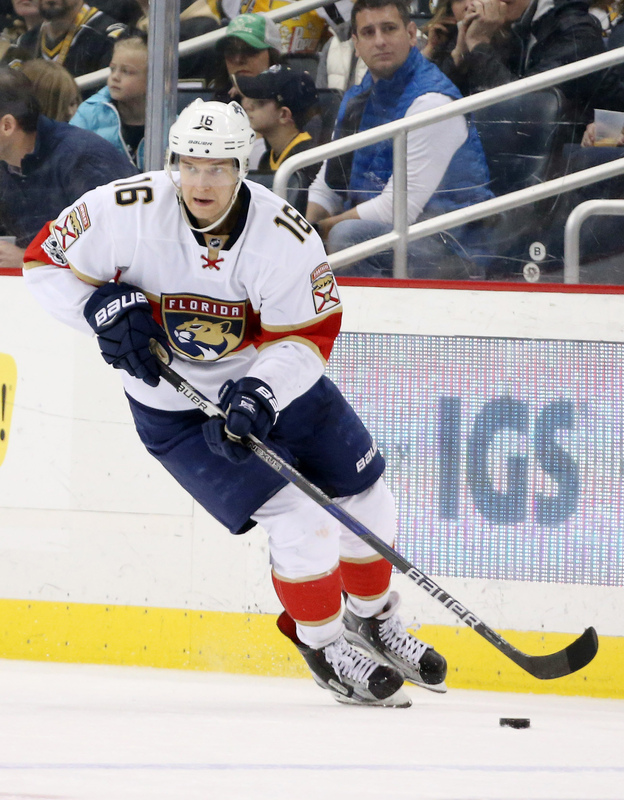 What are the Florida Panthers most thankful for? The upcoming 2018 draft class. It’s not that the Florida Panthers are already out of playoff contention. They’re not. It’s that even if this season doesn’t turn around, and they do end up finishing where they are right now—that is, 28th out of 31 teams—they’ll be in fine shape at next year’s draft. The team already has some solid pieces up front, and two impressive young defensemen locked up long-term in Aaron Ekblad and Mike Matheson, but they need more on the back end and they know it. Luckily, this year’s draft class has several potential franchise-changing options on defense. Rasmus Dahlin, projected at the moment to go first-overall is already a star in Sweden and could make his country’s Olympic squad before he turns 18. Adam Boqvist, another Swede, is just about as impressive and oozes elite offensive upside. Quinn Hughes and Ryan Merkley are both puck-rushing dynamos, though similarly undersized. If the small, mobile defender isn’t your thing, Noah Dobson, Jared McIssac, Bode Wilde and Evan Bouchard all carry more weight and two-way ability, though in different ways. In a nutshell, this year is loaded with defensive talent. Florida has an extra thing going for them in the draft. While they don’t have their own second-round pick, they do have Arizona’s. Since the lottery only moves picks in the first round, and Arizona looks poised for another stint at or near the very bottom of the league, the Panthers are looking at selecting their second player somewhere in the early-thirties regardless of what they do for the rest of their season. There should still be plenty of talent in the early second. Who are the Panthers most thankful for? Quite simply, Barkov is a superstar. Not only is he well on his way to a career-high in points, currently sitting at 26 in 27 games, but he should receive Selke votes as one of the league’s best defensive forwards for the fourth straight year. Though he’s never won the trophy, it’s important to note that he’s still just 22-years old and already playing 23 minutes a night as one of the best two-way centers in the league. Not to mention that he’s signed for just $5.9MM for four more seasons and is on pace for his first 30-goal season. There’s no doubt that Florida has made some mistakes over the past few years, but signing Barkov long-term immediately wasn’t one of them. Surrounding Barkov are Vincent Trochek and Jonathan Huberdeau, two other young stars not yet even halfway through their twenties. Both are basically point-per-game players this season, and though the Panthers clearly rely on those three more than a winning team should need to, they represent an excellent core to build around. All three are signed through at least 2021-22, giving the team more than enough time to give them the support they need. What would the Panthers be even more thankful for? A do-over at the Expansion draft. It was obvious when Dale Tallon regained control of the Panthers that he didn’t agree with some of the decisions made by Tom Rowe and his more analytical-driven team. One of those decisions was Reilly Smith’s $25MM extension, which Tallon jettisoned at the expansion draft just before it was set to kick in. To rid their books of Smith’s contract, they left Jonathan Marchessault available for the Vegas Golden Knights to select, handing over a 30-goal scorer that was owed just $750K this season. Though it was considered a budget-slashing move at the time, just a few weeks later the Panthers signed Evgeni Dadonov to a three-year, $12MM contract and then handed Radim Vrbata $2.5MM on the open market. Sure, Dadonov has been a very good player for the Panthers this season and Vrbata doesn’t come with the same long-term risk that Smith’s deal represented, but after watching the duo rack up 46 points through the first part of the season on playoff-bound (for now) Golden Knights there has to be some regret. Florida had to lose a player, as every team did, but sending Smith, allowing Marchessault to be selected, and receiving just a fourth-round pick in return looks like a huge blunder at this point. At the very least, Marchessault would have been worth much more than that as a rental player if this season had still ended up poorly. What should be on the Panthers’ Holiday Wish List? A bubble to keep Roberto Luongo healthy after he returns. The Panthers are without their starting goaltender once again, as Luongo is out for some time with what is expected to be a groin injury. While James Reimer was signed for this very reason, he hasn’t been nearly good enough this season to inspire much confidence. Luongo, 39 in April, has been having his best season in years between injuries, recording a .928 save percentage and generally looking as sharp as ever. Reimer on the other hand has just an .892 mark (easily the worst of his career) and hasn’t been able to find his game just yet. It’s likely that Reimer rebounds at least somewhat to the .914 goaltender he’s proven to be throughout his career, but if the Panthers are to make any run at a playoff spot this year they’ll need this to be the last injury of the season for Luongo. If Barkov and company can drag them a bit closer, perhaps the veteran goaltender can lead a late-season surge towards respectability. Panthers winger Evgenii Dadonov missed practice today and has undergone an MRI on his shoulder, notes Matthew DeFranks of the South Florida Sun-Sentinel. Head coach Bob Boughner isn’t particularly optimistic about the situation, telling DeFranks that the injury is something that will keep him out “longer than shorter” and that he’s hopeful that he will only miss weeks rather than months. The team has not yet received the results of the MRI. Dadonov is in his first season in the NHL since 2011-12 and has made an immediate impact with the Panthers. He took Jaromir Jagr’s spot on Florida’s top line alongside Aleksander Barkov and Jonathan Huberdeau. As a result, he has already set a new career high in points with 18 (7-11-18) in 22 games while logging nearly 20 minutes per game of ice time. Those 18 points place him fourth in team scoring. The injury will be a big blow to a team that already find themselves seventh in the Atlantic Division and 15th in the Eastern Conference. In the meantime, Colton Sceviour will slide onto their top line although Radim Vrbata could find himself in that spot when he’s activated off injured reserve. The team is hopeful he’ll be available sometime this week. Yet another NHL veteran who was trying to hold out for a new contract in North America is now close to settling for European employment. The Swiss Hockey News reports that Stephane Da Costa is nearing an agreement with Geneve-Servette of the Swiss NLA. Da Costa, 28, was a superstar at Merrimack College from 2009 to 2011 and looked to be the next great story in the NHL after signing with the Ottawa Senators – an undrafted player coming from a non-traditional hockey country of France. While Da Costa proved to be a lethal producer in the AHL, he could never quite stick in Ottawa and left the NHL in 2012. Da Costa spent the past three years with CSKA Moscow of the KHL, putting up solid numbers, but it has been his international play on the part of France that has really turned heads. Beginning with a stellar 10-point performance at the World Championships last spring, Da Costa had reportedly been drawing interest from NHL teams and fully planned on playing with the world’s best this season. Yet, with the new season underway, those offers never came and it seems Da Costa is now ready to move on. While Geneve-Servette is off to a tough start in the NLA – second-to-last currently – they are not without considerable talent up front, including NHL veterans Nathan Gerbe, Nick Spaling, and Cody Almond, as well as San Jose Sharks prospect Noah Rod. Da Costa could help kick start a team that typically performs near the top of the NLA and made it to the final of the 2017 Swiss Cup tournament. A seemingly minor move in the KHL could be of some interest to Boston Bruins fans. In a round-up of their minor transaction over the past few days, the league revealed that the rights to forward Oskar Steen, Boston’s sixth-round pick in 2016, had been acquired by SKA St. Petersburg. While Steen has been playing for Farjestad of the SHL for three years now, an opportunity to play for SKA may be tough for the young Swede forward to pass up. Farjestad is no slouch, but SKA has been wildly successful in recent years, winning two of the past three KHL titles and again tearing up the league with a 17-point lead over the next-best team. SKA graduated players like Vadim Shipachyov and Evgeni Dadonov to the NHL this off-season, but still carry top prospects like Nikita Gusev and Igor Shestyorkin and talented veterans like Ilya Kovalchuk, Viktor Tikhonov, Sergei Plotnikov, and even long-time defenseman Maxim Chudinov, former property of the Bruins. Joining that mix could be a good career-move for the under-utilized Steen, could give SKA a further boost, and could help round out yet another promising prospect to add to the Bruins’ ranks.